Anyone who owns a dog knows that its hair gets stuck to pretty much anything, from couches and chairs to carpets and rugs. 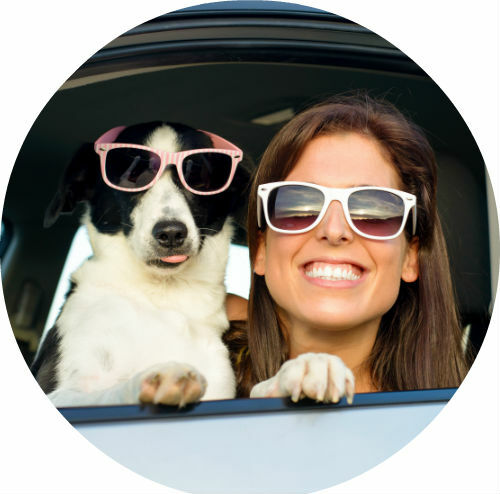 Plus, if you take your dog for car rides from time to time, chances are your vehicle is riddled with pet hair. Fortunately, we’ve got some tips for removing dog hair from your car as well as reducing or preventing dog hair in the car altogether. Lightly spray water on cloth upholstery or carpet and wipe with a squeegee or rubber gloves. The pet hair should come off in clumps, which can then either be thrown away or easily vacuumed. Blow up a balloon and create some static electricity. Rub the balloon across the upholstery to attract the hair and lift it away from the seats. Mix a spoonful or two of fabric softener with some water and spray it onto your cloth seats. Then wipe away the hair with a paper towel and vacuum up any stragglers once it’s dry. In addition to using the ideas listed above, there are also a few steps you can take to help prevent or at least reduce the amount of dog hair that gets inside your vehicle. Thoroughly brush your dog before letting him/her into your car. Purchase or make a pet liner or seat cover to place on your back seat when taking your dog for a ride. Keep your dog in a crate while in the car. This can also be much safer for your pet, especially during long car rides or for dogs who like to move around a lot in the vehicle.